Regular readers will know that I’m a huge fan of the Bath Decorative Fair, held annually in March just minutes walk from Bath’s bustling centre. You can read about my previous visits, one of which included hosting an exciting awards ceremony with Kirstie Allsopp, by clicking here and here. After being run by Robin Coleman for 23 years, the fair has now been taken over by Sue Ede of Cooper Events, who is making what was often viewed as mostly trade fair much more open to everyone. That means that we can all enjoy the amazing stock on offer from many of Britain’s best dealers in decorative antiques. 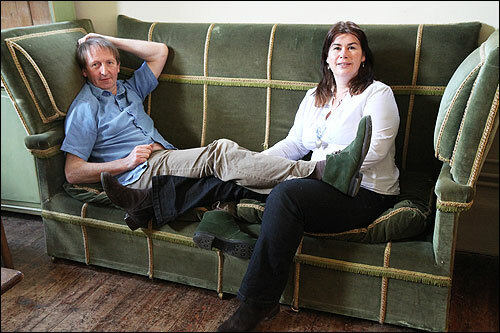 This year, exhibitors include Patrick Macintosh and Richard Nadin of Macintosh Antiques (Patrick below, reclining with his wife), Alys Dobbie of Britain’s Best Retro & Vintage Shop (2012) winner Nannadobbie, Mark Newsum of Newsum Antiques, Sue & Alan Poultney of Scarab Antiques, and of course my Lalique, Gallé and Daum glass dealing colleagues Mike & Debby Moir of M&D Moir. 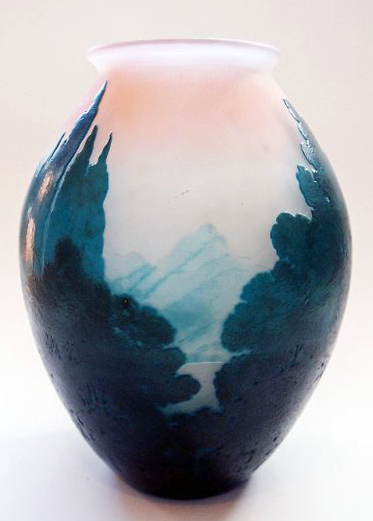 Amongst others, the Moirs will be offering this exquisite and very rare Gallé ‘Lake Como’ cameo vase (above left), made c1900, at £6,500. A number of foreign dealers also make the journey, and I’m particularly excited about seeing the high quality stock offered by ‘Antiques Young Gun‘ Daniel Larsson of D. Larsson Interior & Antikhandel, who is coming from Sweden. The fair has always been relaxed, open and friendly, so it’ll be great to see old friends as well as make new ones. And I’m not the only person who thinks this fair is just wonderful – The Independent just voted the Bath Decorative Fair one of the ten BEST antiques fairs in Britain! Click here to read all about it. I’ll be coming along with the world’s largest selection of Ricardia Art Deco pottery for sale (below), and over 30 different ‘lamp-worked’ glass vases in a rainbow of vibrant colours made in and around Lauscha in Germany from the 1950s-70s. Ricardia prices range from £25 upwards, and you can find more out about this amazing pottery by clicking here. 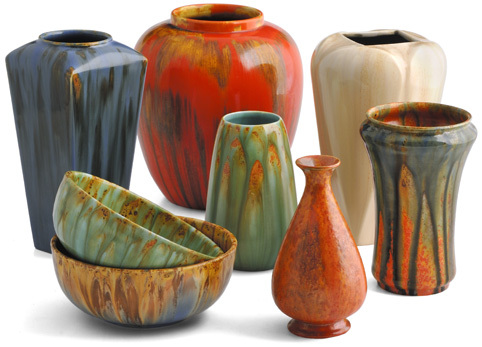 The Lauscha vases are priced from £30-120 each, with discounts for multiple purchases as they look simply sensational when arranged in a group. Find them, the Moirs, and me, on stand 39. 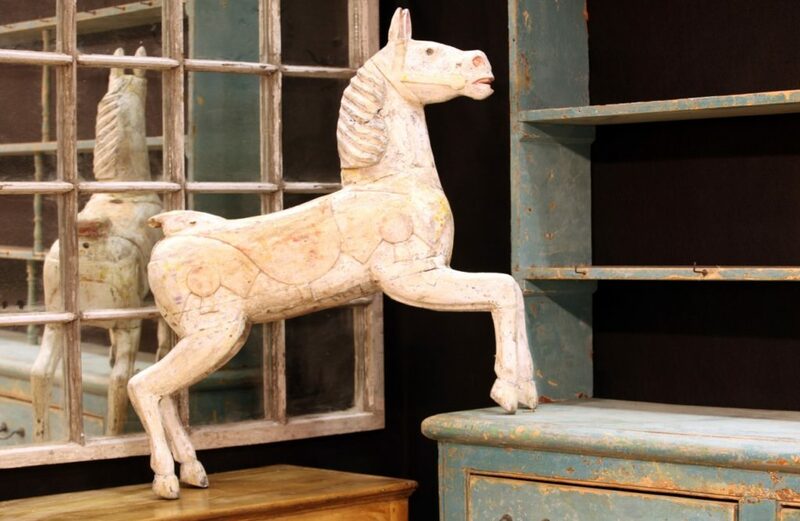 The 24th Bath Decorative Antiques Fair runs from 7th-10th March, with a special preview from 12pm-7pm on Thursday 7th, and the fair open on Friday, Saturday and Sunday from 11am-5pm. To find out more, please click here to visit their website. Those with sharp eyes will notice that you can sign up for FREE tickets! I hope to see you there. This entry was posted in Blog, Ceramics, Events, Glass, Shopping, Travelling. Bookmark the permalink. Was ‘Internet’ First Used For A Transistor Radio?